In our many years of working in the welding industry we have come across some phenomenal welders. We continue to be impressed by the level of skill of quite a few of these men and women. Unfortunately, many business owners allow this skilled labor to be underutilized. 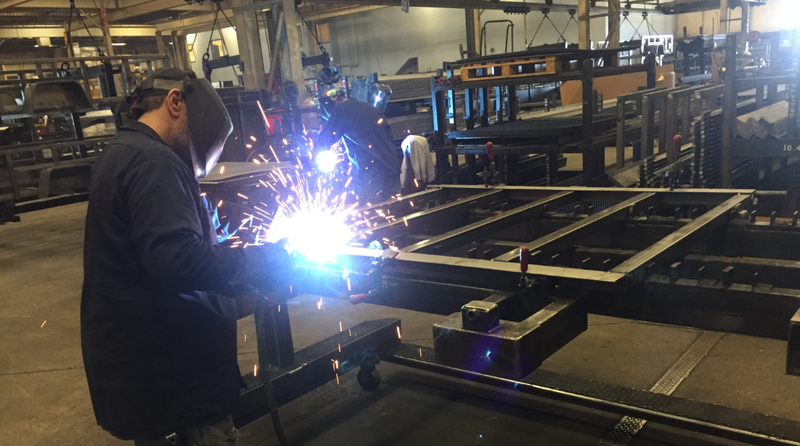 Welder efficiency, which also goes by other names such as welder factor, operator factor and arc time, is perhaps the most important metric when considering productivity in a welding shop. Many employers pay good salaries to welders based on their skill, but their ability is not taken advantage of in terms of productivity. Welders are paid primarily to weld, but they perform many other tasks in the typical fab shop: grinding, fitting, tacking, handling parts, changing gas cylinders, changing wire, changing contact tips and many other tasks. Every time the welder does not have his or her arc on you are not making money. So it is necessary to increase this efficiency. In other words, let’s get rid of as many non-value added activities to allow the welder to weld more. Here are 5 ways to increase welder efficiency and at the same time make their jobs easier. Provide adequate fixtures – set up time (fitting/tacking) can sometimes take over 50% of the time spent by a welder. Many welders that do repetitive work end up creating their own fixtures to make common weld joints easier and faster to make. However, when a fabricator buys a robot, fixturing becomes very important. 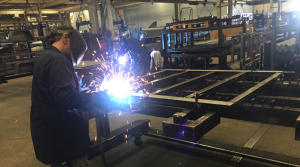 We get great tooling so that the robot can spend time doing what they pay for, welding. It only makes sense that we should to this for welders as well. Keep equipment in good repair – faulty equipment, even equipment that only has “hiccups” from time to time can cause a lot of problems that cause the welder to stop welding. Voltage drops due to undersized cables, loose connections or frayed cables can create large amounts of spatter which require grinding time. These issues can also cause an erratic arc which decreases the life of contact tips, diffusers and nozzles. Increasing changeover of these parts again takes away from welding time. Keep equipment in good repair and see efficiencies increase. Excessive spatter adds to grinding time. Develop welding procedures – proving your welders with adequate instructions on what parameters to use on different joints and material types is essential. Even the best welders will spend a lot of time fine tuning a procedure when parts, thicknesses of positions change. A written welding procedure allows the welder to set his or her machine and go, thus eliminating time with trial and error. Train your welders and welding operators – is important for welders and welding operators (operators of robots and fixed automation) to understand what effect the many welding variables have on the deposited weld metal. By knowing what happens if you increase or decrease amperage, voltage, travel speed, travel and work angles, contact tip to work distance (in GMAW an FCAW), welders can more easily and quickly troubleshoot bad welds, make the necessary adjustments and get back to welding. Consider the quality of your materials and evaluate alternatives – there is a reason why some fabricators will pay a premium for premium wires and rods. There are certain applications that cannot tolerate any kind of variability such as wire flip or changes in wire diameter that affect amperage. A wire that may be OK for welding dumpsters may not be adequate for high-speed robotic welding. If your welders or your robots are having issues with wire tangling, clogging liners excessively, missing the joint (robots) and excessive tip usage don’t discard evaluating different consumables. This concept is also true for other inputs such as welding guns, contact tips, nozzles, etc. There are many other ways to increase welder efficiency. The above five should keep you busy for a while. This will depend of the diameter of the wire and how fast you want to make the 4mm weld. Also, is the weld a fillet? or a groove weld? The volume of weld metal needed will determine your travel speed at a specific wire feed speed. What diameter of wire are you running? I like how you suggested keeping welding equipment in good repair. My dad is a welder and is always looking for ways to increase efficiency. Thanks for the tips on increasing welder efficiency.